The 100th annual meeting of the American Association for Cancer Research – held April 18-22, 2009 in Denver, Colorado – featured poster and symposium sessions on diet, nutrition, and cancer. Research results highlighting the potential for whole foods and isolated plant compounds, vitamins, and other natural products to prevent and treat cancer were presented by over 50 teams of researchers from across the country and international institutions. Many studies presented at AACR examined compounds extracted from herbs and seeds for potential anticancer properties. Thymoquinone, a phytochemical compound extracted from the plant Nigella sativa, was tested against several cancer types. In laboratory experiments using pancreatic cancer cell lines, investigators from M.D. Anderson Cancer Center observed that thymoquinone was able to increase the cell-killing effects of gemcitabine, a chemotherapy drug most commonly used in pancreatic cancer, possibly by regulating genes that would make the cancer cells more sensitive to gemcitabine treatment. Another set of experiments from the University of Miami suggested that the combination of thymoquinone and another compound, curcumin (which is found in the spice tumeric), had anti-inflammatory effects in benign prostatic hyperplasia (BPH). Inflammation is thought to play a role in the development of some tumor types, such as prostate cancer. In experiments performed in cultured cells, researchers from Thomas Jefferson University in Pennsylvania showed that doses of vitamin K1 given to liver cancer cells, along with the targeted drug Sorafenib, could both inhibit cell growth and cause cell death. In these experiments, the doses of both vitamin K1 and Sorafenib given to the cells were not large enough to stop cancer cell growth alone, but the combination of the two compounds at low doses had cell-killing effects. The use of vitamin K1 with low-dose Sorafenib may be a promising approach to liver cancer prevention in people at high risk of the disease such as those with cirrhosis, the researchers explained. Eating walnuts may prevent breast cancer. Scientists from Marshall University School of Medicine in West Virginia reported that transgenic mice fed the human equivalent of 2 ounces of walnuts a day were significantly less likely to develop mammary tumors than mice fed a standard diet. In addition, mice on the walnut diet that did develop tumors grew smaller tumors in fewer glands. 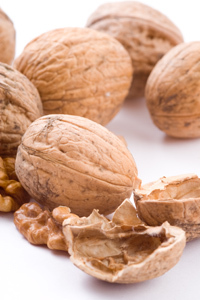 Analysis of the molecular effects of the diet showed that walnuts increased the amount of omega-3 fatty acids and decreased the amount of omega-6 fatty acids in the mammary glands. The walnut diet also altered the expression of genes involved in cell proliferation, apoptosis (programmed cell death), and differentiation (cell maturation). “With dietary interventions you see multiple mechanisms when working with the whole food,” said Dr. Elaine Hardman, lead author of the study, in an accompanying press release. Ginger helped prevent or reduce chemotherapy-induced nausea when taken with traditional anti-nausea drugs by patients with cancer, researchers have found. The results are from a randomized, double-blind, placebo-controlled clinical trial, the largest study to examine the potential effects of ginger on chemotherapy-related nausea. The study will be presented May 30 at the ASCO annual meeting in Orlando, FL. “We have found that ginger supplementation is an effective tool against chemotherapy-related nausea,” said lead investigator Dr. Julie Ryan of the University of Rochester Medical Center, who discussed the findings at a press briefing last week. All doses of ginger evaluated in the study significantly reduced nausea compared with placebo, she noted. The trial, funded by NCI’s Community Clinical Oncology Program, included 644 patients, most of them women, who were receiving chemotherapy for breast, digestive, lung, or other cancers. These patients received a placebo or one of three doses of ginger (0.5 g, 1.0 g, or 1.5 g) for 6 days, including 3 days leading up to the first day of chemotherapy and 2 days after chemotherapy began. They also received traditional anti-nausea medications during the study. Patients rated their nausea four times per day on a scale of 1 to 7. Each dose of ginger was more effective than the placebo at mitigating nausea. The most effective doses were either 0.5 g or 1.0 g, taken during the first day of chemotherapy. Effectiveness decreased linearly over a 24-hour period. The highest dose may not be as effective, the researchers speculated, because it is more than the maximum absorption dose for biological activity. In the Spring 2009 issue of NCI CAM News, the article “Vitamin C as a Potential Anti-Cancer Agent: Progress and Controversies” gave credit to Dr. Humphrey Osmond as having first speculated that vitamin C could be useful as an anti-cancer agent by strengthening collagen and thereby preventing the spread of metastases. The article should have instead credited Dr. William McCormick.